Mobile Apps aren't just a gimmick. They can provide highly valuable productivity tools, sales force resources, and income streams to your business. Edge Mobile Apps give you the edge you’re looking for on all of your mobile devices. Your website speaks for your business. What does it say to your clients about your business? It is simple to use and navigate? Does it work as it should? Engaging and inspiring website design coupled with rock-solid Web development. We have you covered. Intuitive UI & UX design do not come by accident. Continual research is key to achieving truly intuitive results. From well organized information architecture and persona creation to memory and perceptual limitations–the psychology of your users matters. How much do you think about your users' needs, goals, and desires? Are they satisfied with your site? Are you sure? How do you know? Usability Testing provides you with critical insights and solid data to direct usability improvement efforts. People. It’s the people that make the difference. Whether dealing with a Fortune 500 client or a local small business (like us! ), a project’s success always come back to the people involved. Edge Webware is blessed to have not only a highly talented and skilled group of dedicated and professional employees and contractors, but also a group of people who are friendly, personable, and honest. Oftentimes in business project stakeholders’ focus is overwhelmingly on the technical qualifications of a team while the qualifications related to character are frequently minimized or even ignored. Yet, it is our firm belief that working with us should be a blessing to our clients in terms of both your resultant success and in the peace of mind and enjoyment we all share while we work together. So why “ninjas?” Ninjas are a highly skilled, disciplined, resourceful, and dedicated lot. 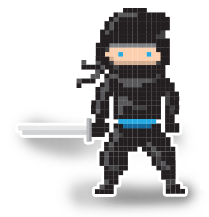 Ninjas solve complex problems on the fly and with expert precision. In a word, ninjas win. How will we win for you? Our adept team of designers and developers has numerous years in Web design and Web/App development. Since our inception, our clients’ challenges have led us to cover the spectrum in the Web, mobile, and desktop programming world. We have delivered repeatedly, because of our breadth and depth of expertise and our ability to understand our clients’ needs. Contact us today to find out more about how our team can help your team accomplish all of your Web and interactive goals! No project is too large, too small, too simple, or too complex. If it can be done, Edge Webware can do it!